LifeObject is a material exploration of the relationships between the artificial and the natural in the future built environment. 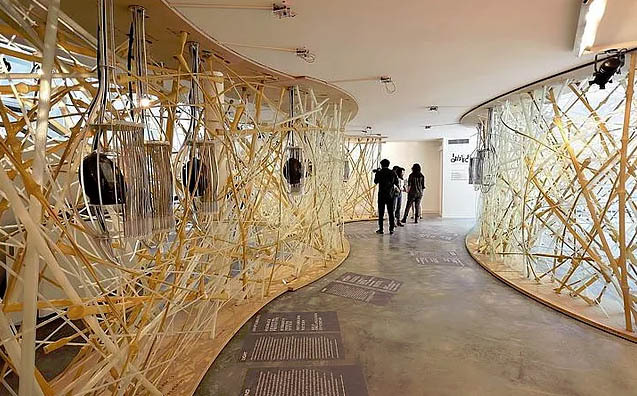 Its starting point is nature’s iconic model of a home – the bird’s nest; an assembly of weak and light found materials with no additional joints or glue, out of which emerges a free-form complex structure that is extremely light, robust and highly resilient. 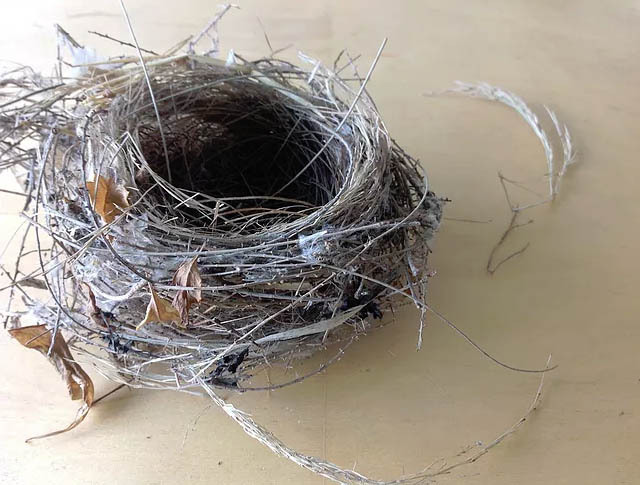 Through an experimental process of scientific analysis, coding, material research and design, LifeObject transposes the resilient properties of a bird’s nest into an architectural form. From this material system, a new matter-structure emerges – a volumetric porous material that is lighter than feathers, a free-form structure that is stable yet flexible. Synthetic, yet profoundly biologically inspired, the materiality of the LifeObject demonstrates common biological characteristics. Self organisation, adaptivity, variation, redundancy and low-energy synthesis present alternative design paradigms to the mechanistic architectural approach of strength and control, suggesting the interpretation of the LifeObject as a biological material. Concepts of intelligence and movement are introduced, making the hybrid system of the LifeObject. Integrated ‘Breathing Cells‘ bring it to life as they provide feedback to human presence, activating both structure and space. In a gentle non-mechanical movement, generated by the programed molecular change of advanced shape-memory material, the cells open up to reveal a gallery of biological wonders. Synchronically, liquid crystal surfaces change translucency to expose the natural outdoor setting. 1400 rods, ranging from 1 cm to 5 cm in diameter, covering approx. 27.13 cubic meters. That is the numeric translation of the data obtained from the sparrow nest and implemented in LifeObject. A bird’s nest, achieving complex form and resilient structure by simple components. The algorithm for the production and assembly of the LifeObject installation began with a specimen of the Jordan Sparrow nest. The nest was scanned and analyzed, to extract the relations between twigs, statistical dimensions etc. The quantitative data, the qualitative data, and the material behavior were examined to determine the relations among them. The combination of these three different aspects was integrated into one iterative algorithm which was then executed on the planned installation objects. In each iteration of the algorithm a rod was assigned with random parameters derived from the nest analysis. Next, the rod was placed in the object volume according to its parameters. The rod’s density within the object volume determined the number of iterations in accordance with the nest’s twigs density. ​Using the data extracted from the algorithm, all the rods were manufactured maintaining the same statistical deviation derived from the nest analysis. In nature, the sparrow uses some of the twigs to anchor its nest to the tree branches. Similarly, rods that anchor the assembly to the pavilion were chosen (about 25% of all rods) and their position in space was locked. ​Although the second group of rods (75%) was manufactured using the same statistical deviation, and since they were assembled using the same methodology, derived from the nest analysis, their position was not predetermined. These rods were interwoven into the structure (anchors and rods) with higher position flexibility, to enable a resilient structure that follows the sparrow’s nest constructive paradigm, while maintaining “planned degrees of freedom” to the builder. LifeObject is a new matter-structure, made of synthetic fibre composites (FRP) that are structured similarly to all living matter, in a fibre-matrix organization. The natural cellulose fibres of the twigs are transposed into advanced fibres such as aramid and fiberglass that are knit or braided. Fibres are merged with epoxy resin, each keeping its physical and chemical identity, yet forming a composite material with novel properties, that is then transformed into varied components. ​In a hierarchical material construction, over 1500 composite “artificial twigs” are interlaced to constitute an extremely light yet stable volume (of 10kg/m3). Form and stability on the micro level of the component as well as on the macro level of the structure are achieved by adaptability to stress, through processes of self-organization. In contrast to standard FRP fabrication processes, the fabrication and shaping of the elements relies on the fabric materiality of the composite rather than on moulds. Correspondingly, global shape is the result of local interactions between the multitude of varied components and their relative flexibility, rather than the action of joints or adhesives. As in biology, material and structure are synthesised or assembled by low-energy processes. ​Shifting towards the adoption of a biological paradigm within architecture, we abandoned deterministic control for an open-ended fabrication and construction process that is attentive to the qualities of this new matter-structure, replacing parametric control over the material to achieve performance, by learning through the material.